Mobile applications are also a hub to conduct business activities. Almost for every service and product, at least five applications are available in the market. These are several e-commerce websites which had launched their applications as well to make everything available just a call or message away. All these applications benefit in several ways but there are so many apps people never want to use ever again. There could be several reasons to quit using any application but majorly people get pissed off with the loading time, poor functionality, distracting navigation, too much of advertisements, useless content and pathetic design. When designers or developers neglect the psyche of users and launch any app without doing proper research of the market, the outcome can be disastrous. 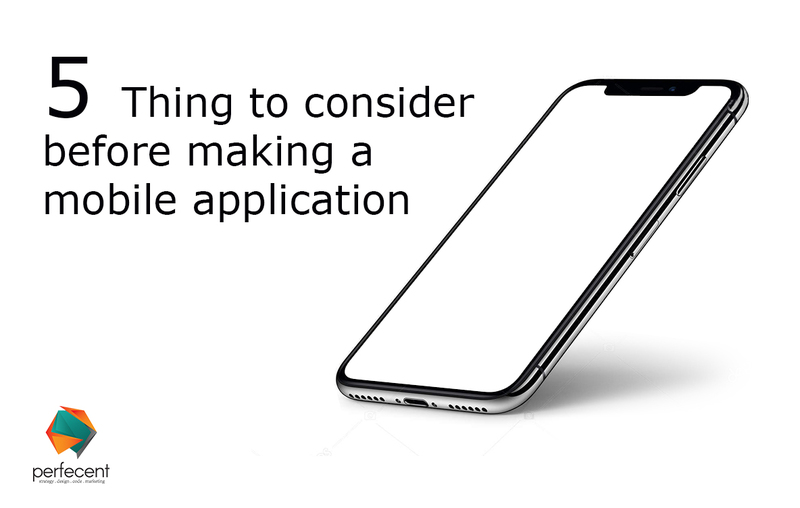 In this blog, I am writing about five things to consider before making a mobile application so that you can promote your product or services efficiently in the market. Ornamentation and junk of content confuse the audience and disturb the navigation system of application a lot. It`s better to keep relevant and appropriate content and discard extra stuff before you start to design and development process. The simplicity of design is always appreciated by users because it allows them to explore more. Simple design converges the focus of audience in a way that they end up buying the service or products. For a mobile application, the visual appeal is the backbone. It`s not always the design that lower down the aesthetic appeal. Sometimes the images selected by client or product photography is not of worth. People focus a lot on product pictures before placing an order. High-resolution images, unique concepts, stylish product photography and clear view of products being used by people etc. all play a vital role in creating an image of the brand or product. Poor images quality, wrong selection of background colors in photography and copy-pasted images can ruin the overall look of the application. No one likes to wait. Your application should start within few seconds, at least some of the features should be quick responsive. Excessive loading time irritates the user and they quickly start looking for an alternate of the application. Set the appropriate tone to communicate through design and content. Selection of design elements and colors should not be random. Study before you apply anything because every color, gradient, line, and shapes create an impact in human mind. The human mind automatically builds a credibility chart depending on the colors, shapes and overall look of the application. So in case, your selection of design elements is not suitable your brand`s value may suffer. Considering the fact that human behaviors and needs differ from each other because of age, gender, nature, likes or dislikes, geography, environment etc. You cannot satisfy the needs of every group so it’s best to study more about the target audience and produce an application according to the requirements and demands of that specific group.